It is different from what books say (think about the difference between a blurry static picture and a Dolby surround 3D Full HD movie on a giant screen, especially the dolby surround part, only louder). It is different from what you thought it would be like, in almost every aspect. Your sanity is directly correlated with your partner’s patience and dedication (I happen to be a very lucky guy in this aspect). Hormones kick in, that is, no matter how many children you loved and hugged before, kissing, hugging and smelling your child is radically different, and the only way to understand this is to have your own child. You’ll never experience such contradictory feelings within such short timeframes, that is, you’ll want to shout at him, only to discover that you’ll laugh and hug and kiss him almost at the same time. If you believed that you were a patient person, the whole universe will collaborate with your child to devise some ingenious plans to test you in ways you have never imagined. You’ll wonder when the last time was you prayed to anything so much, so sincerely and so forcefully so that your child will go finally to sleep. The dullest and the most ordinary parts of your home will be the subject of your risk analysis for a long time (“hey, get that thing out of your mouth, and no, don’t you ever think about hitting your head or eyes on that sharp corner, and… oh, don’t pull… that… thing… oh god!”). Going to work will be much more difficult because you will not want to leave him, especially when he’s smiling at you. People will think you are crazy because you’ll swear that the strange sounds he makes actually correspond to words. (“Hey, but he just said mama! and hallo! didn’t he, I heard it, come on!”). There will be radical changes in your photo collection (and a lot of blurry photographs, don’t you every try to force a baby to stand still). If you thought ads were disruptive while watching a movie, you’ll be delighted by the interruptions caused by a waking baby in the most dramatic moments. You’ll try to learn the secrets of being a Ninja, so that you can move around without making any noise, especially when he is finally asleep. You’ll learn that you can’t argue with a crying baby. He will always win. The one who shouts louder always wins. You’ll need a village to raise the baby. 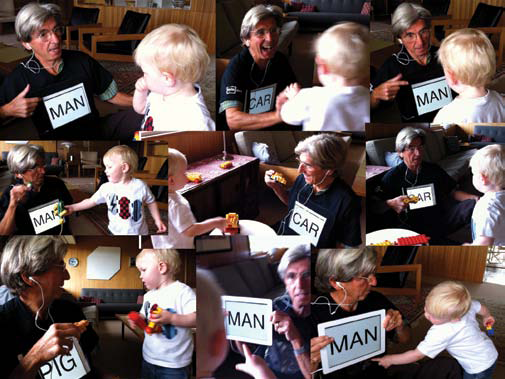 A pair of nice and helpful grandparents will be a good starting point. You are going to fail. You are going to forget what you learned. You will start over. Whatever is valid for others will be somehow invalid or different for your case. You will fall and stand up again. Just like your child does. You will be constantly asking yourself “am I good enough?”. You’ll probably be able to get the correct answer only after about 20 years. You’ll never be the same and no matter how much you might complain sometimes, you’ll never ever want to go back to the point in your life where you don’t have him. So, thank you son, for the true richness you brought us and a very happy birthday to you!